FOR Years, Chobham RFC has punched above its weight on the field, and now the progressive village team is a step ahead of towns and cities when it comes to education, writes Andy Fitzsimons. With progression very much the order of play, Chobham was one of the first rugby clubs in the country to launch a two-year, full-time, academic programme for 16-18 year olds, who want to combine playing rugby with a wider career in sport, including coaching and event management. Run in conjunction with SCL (Soccer Coaching Limited), a leading provider of coaching and education in the south east of England, Chobham’s West Surrey Academy (WSA) is now well and truly up to speed, and thriving. The Academy was set up in 2016 and several of its second-year scholars have accepted university places and found employment in sport after moving to Chobham to complete their BTEC extended level 3 diploma in “national sport: performance and excellence”. And with places for its September 2017 intake already well advanced, it’s clear that the club’s popularity is rising and it has the right vision and knowhow to get the best out of its players and students. Speaking exclusively to the News and Mail, Liam Cranford, WSA manager, said: “We first learned about the education opportunity after one of our senior teams played Blackhealth RFC, who were working in partnership with SCL. “I have previously worked with the company, so when Chobham approached me to set up a similar programme for them, I knew it was a great opportunity to reach out and upskill more young people in the local community. “Our programme engages students both on and off the field. It keeps them in further education, develops their rugby skills and, after two years, they leave us in a better position to make informed decisions. 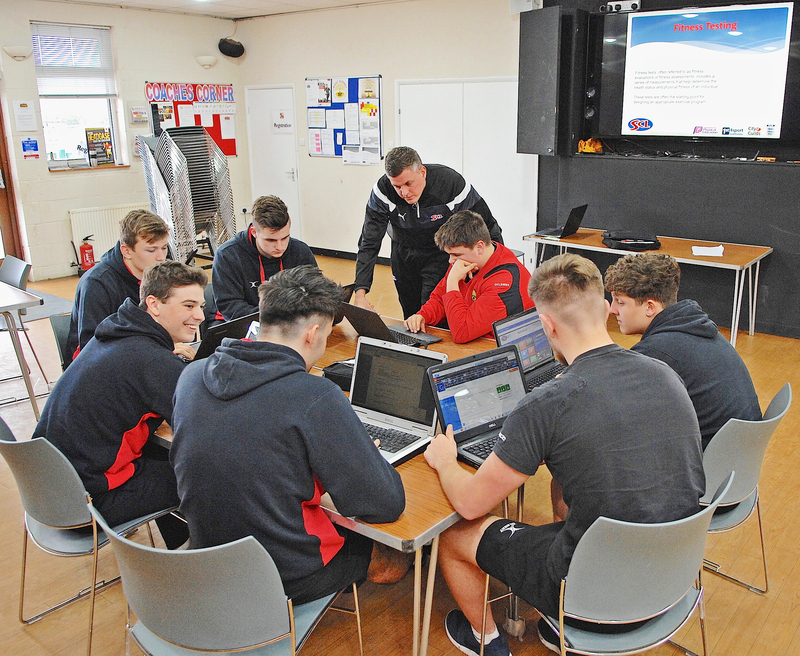 “For us, it’s about harnessing students’ passion for rugby, but delivering it alongside an enriched education programme to further their onward education through sport, or help them move into full-time employment,” he added. Cranford, who is a Rugby Football Union level 2 coach, with experience of working with Harlequins and London Irish – among others, also believes that having the right attitude and aptitude to learning is something that the club looks for when interviewing prospective candidates. “The purpose of the programme is not to create elitism, but to find people with the right attitude to learning. It’s about finding students who have the passion to want to push themselves, so they mirror the effort level that we put in; both on and off the park,” explained Cranford. “In any given day, students can spend two to three hours covering the academic side of things, followed by a couple of hours playing rugby. “The practical side is split between field sessions, playing matches, conditioning sessions and player analysis; all of which contribute to the success and wellbeing of the individual. “After completing the two-year BTEC extended level 3 qualification; which is equivalent to three A-levels, students will have enough UCAS credits to go to university and study a sports-related discipline, or to move into the sports industry at large,” he added. To ensure that students continue to receive a first-class education, Chobham’s fully-funded education provision and facility is assessed by OFSTED. The schools’ inspectorate looks at the quality of how the education is delivered; the planning and provision for it, and that the playing and education facilities at Fowlers Wells in Chobham are well maintained. As part of the two-year course, which mirrors the college academic year, students can expect to learn about principles of anatomy & physiology, sports coaching, risk analysis; coupled with sports performance, sports nutrition, event management, and rules, regulations and officiating in sport – to name just a few modules. The Academy also competes in the Association of Colleges’ league South East Division 1; which it won in its first season, playing against the likes of Godalming College, Henley College, Berkshire College of Agriculture and Peter Symonds College. Charlie Andrews, who joined the West Surrey Academy as a second year scholar in 2016, is just one of a number of students who will graduate this summer and has benefited from the innovative educational pathway. He said: “Before I came here I was studying with another educational provider in Worplesdon, which wasn’t anything like what Chobham offers. “People learn in different ways; and for me personally, I liked the idea of being able to learn through more coursework based study, and to have the opportunity to play competitive rugby around my education. “There’s nothing wrong with sitting in a classroom each day learning, but that format didn’t work for me, which is why I was drawn towards the Academy. “I have a passionate for rugby and to work in sport, so, for me, it was absolutely the right decision. I have no regrets whatsoever, as it has given me the chance to progress onto higher education,” he added. FOR more information about the West Surrey Academy, visit http://wearescl.co.uk/chobham-rugby. Alternatively, call 07879 405402 or email: manager@westsurreyrugbyacademy.co.uk.